Nostalgia has never been cooler – or more profitable. We see it these days in the clothes we wear, the TV shows and films we watch, and in the wave of bands reuniting. 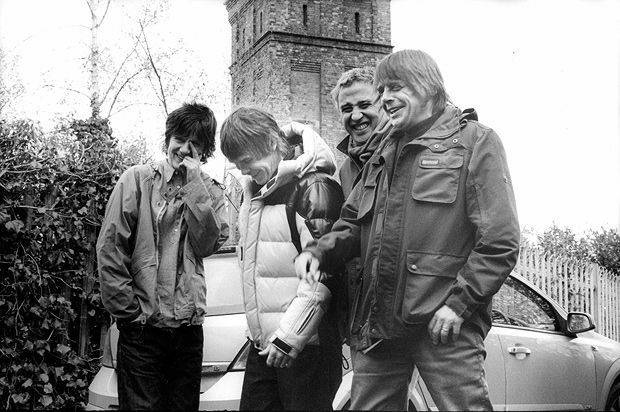 Riding this surf as high as they can are Madchester legends The Stone Roses, who, after their 2013 Glasgow Green and 2016 T in the Park triumphs, are chucking fans a bone in the form of three gigs next June: Belfast's SSE Arena, London's Wembley Stadium and Glasgow's Hampden Park. With this in mind, here are the five bands we're most happy to remember the good old days with. At their heyday: After being invited by Noel Gallagher to support Oasis on their 1995 tour, OCS caught on when their second album, Moseley Shoals, got to number two the following year. In 97, their third album Marchin' Already topped the charts, toppling Oasis' Be Here Now. Where are they now: Still banging the drum for Britpop, there have been numerous lineup, iterations and re-releases over the years, but three of the four original members are touring this December. At their heyday: Burned a picture of Morrissey outside the EMI offices for a photo op, but it was probably their 1997 third album When I Was Born for the 7th Time, featuring 'Brimful of Asha', that was most critically-acclaimed. Where are they now: Two original members remain – Tjinder Singh and Ben Ayres – and their most recent album Hold on It's Easy was released last year. At their heyday: Formed from the ashes of the Housemartins, their debut album Welcome to the Beautiful South produced a number two single, 'Song for Whoever'. It wasn't until 1994 that Carry on up the Charts, a best-of compilation unexpectedly hit that year's Christmas number one spot. Where are they now: The lineup was ever-changing, and, after splitting in 1997, members have been variously solo, duos, trios and nine-pieces in the shape of the South, who are on tour in October and November. At their heyday: Along with Placebo, Kula Shaker won the In the City competition in 1995 which resulted in a record contract from Columbia Records, who were desperate to snap up a band to mimic Oasis' success. A number one album K came in 1996, followed Peasants, Pigs & Astronauts which reached number eight in 1999, as well as a slew of top ten singles, 'Tattva', 'Hey Dude', 'Hush' and 'Sound of Drums'. Where are they now: After splitting in 1999, they reformed a few times over the years, in 2004 for the School of Braja charity album and again, more permanently, in 2006. Their latest album K 2.0 reached 32 in the charts this year, and they're also touring in December. At their heyday: Their anarcho-punk pop didn't yield too much critical success, barring 'Tubthumping' which made the top ten in the UK, USA and Canada in 1997. Their world cup single 'Top of the World (Ole Ole Ole)' peaked at number 21 in 1998. Where are they now: Their disbanding statement – 'That's it then, it's the end, with neither a whimper, a bang or a reunion' – made their stance on getting back together pretty clear. Since then, various members have used Kickstarter to fund a documentary, written theatre shows, and collaborated in different guises. Tickets go on sale Fri 30 Sep at 9am. The iconic Mancunians, lead by singer Ian Brown, do their indie-rock thing.